I am very surprised by some of the issues being raised, because, as is common knowledge within academic institutions, faculty NEVER speak for the institution, which is a role that is the exclusive prerogative of the institution’s ADMINISTRATION. It would reflect well on FAU if your deans and other representatives of the institution were to DEFEND their faculty when they tackle complex and controversial issues like this one, not imply that they may be doing the institution harm. It would be in the best interests of FAU and the public to stand up for academic freedom and for freedom of inquiry. Not only that, but I have always assumed that public institutions such as FAU stand for truth, knowledge and justice as this nation’s highest values. If that is not the case, then I would suggest that that really ought to be made known to prospective students and their parents. Dr. Tracy is simply attempting to sort out the true from the false about an event that has now become of immense national interest, especially when a major movement is afoot to confiscate semi-automatic weapons from the general population, which is a stunning development contrary to our nation’s history. When asked whether he believed in conspiracy theories, filmmaker Michael Moore replied, “Only those that are true.” The problem is telling the difference. Having spent much of the past 20 years in collaborative research on dark events (the JFK assassination, 9/11, Sen. Paul Wellstone’s death), Sandy Hook looks to me like part of an escalating series of covert operations designed to promote public hysteria to incite gun control and subvert the 2nd amendment. Here are some reasons why. A theory is simply an interpretation of facts in a given case. When the police investigate a crime, they form a theory of the case. In courts of law, prosecutors and defense attorneys usually offer alternative interpretations. With Sandy Hook, figuring out what happened poses special challenges. The facts are not obvious. There were inconsistencies from scratch. The suspect, Adam Lanza, was a student there; then he was not. His mother was a teacher there; then she was not. The principal called the local paper to report the shooting; then she was among the first to die. Even if Lanza, 20, had done some shooting, the ratio of kills to targets was remarkable. As a Marine Corps officer, I qualified with a .45 four years in a row and also supervised recruits of his age in their marksmanship training. I don’t see how he could have done it. Police radio in real-time reported two suspects headed toward the officer calling in, one of whom was apprehended. The other was tracked into the woods, as police helicopter footage shows. We have no idea what became of these suspects. So what happened? Most likely, Adam Lanza and his mother were killed the day before with Adam Lanza’s body picked up by police. He was attired in a SWAT outfit, including body armor, and stored in the school. I argue a three-man team entered the school. One was arrested in the school, cuffed and put on the lawn. Two went out a back door; one of them was arrested and the other apparently escaped. Those arrested currently are not in police custody; their names were never released. That is a telling sign that we are being sold a story based on fiction rather than on fact. Does anything else matter? Most Americans are unaware the Department of Homeland Security has acquired 1.5 billion rounds of .40 caliber, hollow-point ammunition, which is not even permissible during combat under the Geneva Conventions. A subcommittee of the Senate Committee on Homeland Security has issued a study of 680 reports from “fusion centers” that integrate federal, state and local anti-terrorism efforts. It found no evidence of any domestic terrorist activity. The absence of any terrorist threat and the existence of more than 300 FEMA camps and special boxcars to carry dissidents to them have been deliberately withheld from the public. Since Homeland Security has no foreign commitments, those camps and ammunition have to be for domestic consumption. Homeland Security appears to be gearing up to conduct a civil war with the American people — but 80 million armed families stand in its way. What better excuse could there be for banning assault weapons than the slaughter of 20 innocent children? Sen. Diane Feinstein, D-Calif., has a gun control proposal that would lead to the confiscation of virtually every semi-automatic weapon in the nation. That’s my interpretation of Sandy Hook. Jim Fetzer reports for Veterans Today and is a McKnight Professor Emeritus at the University of Minnesota Duluth. According to the Social Security Death Index, for example, Adam Lanza actually died the day before the shooting; according to ABC/NBC/CBS, only hand guns were found with his body; and my co-author, who is an expert in electronics, has discovered the CT Statewide Emergency Radio Network was manipulated before the event! That Gov. Andrew Cuomo of New York encouraged the passage of draconian gun laws by the legislature over-night–admitting the public would not have stood for it–reflects how serious this has become. As it happens, I have also done extensive research and publication on complex and controversial issues of comparable interest, including both the assassination of JFK and the atrocities of 9/11. In those cases, as with Sandy Hook, what we have been told does not hold up to critical scrutiny. How can academicians contribute to solving problems that the nation confronts if they are being intimidated and cowed by administrators who do not understand the role that the academy should fulfill within the broader context of scholars’ obligations and social responsibility? Dr. Tracy deserves your support and admiration, not your condemnation. I am writing you to protest the anti-Jewish, anti-Israel bias of James Fetzer. Without any supporting documentation or proof, he declares in his articles that Israel is responsible for the Sandy Hook massacre and previous staged events. This is highly irresponsible. How dare he! If he has any valid argument or evidence to back up his outrageous claim, he should state it. Otherwise, he should keep his own hateful opinion to himself and stop trying to indoctrinate your readers into becoming anti-Semitic bigots. It seems odd that a retired professor trying to defend your right to free speech would indulge in a verbal hate fest against the Jews. That is not going to do you or your arguments any favors. I hope you will remove for this website all of Dr. Fetzer’s articles which contain such offensive remarks, as they have no place here. I am unaware that Dr. Fetzer made any specific allegation that Jewish or Israeli elements carried out the Sandy Hook massacre. My understanding is that a colleague of his at Veterans Today, Gordon Duff, wrote a brief article discussing talk show host Mike Harris’ December remarks asserting this theory. Perhaps that’s what you mean. Since you are proposing that I censor my blog, if you have any citations in this regard it would be helpful if you could provide these. Thank you very much, Professor Tracy, for responding to my concerns. Unfortunately, I am rather alarmed that you would not be better informed about what is posted and linked to your own website, especially by a colleague of yours who claims to be trying to support you. As you can see, he stands with Gordon Duff in blaming Israel at least in part for Sandy Hook! So you are now an expert on Veterans Today as well as Sandy Hook? What I find rather remarkable is how you assume that you are some kind of moral arbitrator of the universe. It is a common debate tactic to go on the offense when you are at fault. It seems to me that your position is one of “guilt by association”, where you are holding Professor Tracy responsible for the opinions of others, who are, like me, also entitled to freedom of speech and to freedom of inquiry about all these things. Cases like this–which are complex and controversial–qualify as severe tests of our commitment to those values. Freedom of speech and freedom of inquiry do not exist to allow academicians and scholars to reiterate innocuous opinions that are widely held, but to inquire about situations that may not be as they have been presented as being. Professor Tracy and I do not have to agree about every issue in order to agree about some, including the core values essential to universities. Professor Tracy and I are both trying to sort out what happened at Sandy Hook. The article to which you object was originally entitled, “Sandy Hook: The rest of the story”. I did not choose the title used. And the passage you cite was a quote from someone else. None of your complaints about me dispute the points I was making about why the university should be supporting Professor Tracy. Instead, you seem intent upon making a case for anti-Semitism when there is little case to be made. I am not anti-Semitic, but I am very critical of the role of Israel in world affairs today. I cannot help but notice that you seem to be highly selective in the points you make. I have also written about Israeli complicity in 9/11, by the way, including “9/11 and the Neo-Con Agenda”, “Is 9/11 research ‘anti-Semitic’?”, “Peeling the 9/11 Onion: Layers of Plots within Plots” (with Preston James), and “James H. Fetzer: 9/11 IRAN REVIEW interview”. Another he has published is “9/11 and Zion: What was Israel’s role?” But if Israel was involved in 9/11, should we not be addressing it? In addition to being a journalist for Veterans Today, I am the founder of Scholars for 9/11 Truth. I organized its first national conference in Madison in 2007 and its first international conference in Vancouver in 2012. I also edited its first book, THE 9/11 CONSPIRACY (2007), and I have published widely about 9/11. What has struck me most about your email to Professor Tracy is your complete failure to distinguish between anti-Zionism and anti-Semitism. Is this a difference you don’t understand? VT and I are both anti-Zionist but are not anti-Semitic. Since you are reading some of my articles, where do you find me dismissing the opinions of others or their value as human beings on the basis of their ethnic heritage or religious faith? I and others at VT are critics of the actions and policies of the State of Israel, including of course its grossly abusive treatment of the Palestinian people. That is NOT anti-Semitism. It is not anti-Semitic to raise objections to the violation of the rights of Palestinians and repeated violations of UN mandates. A rather large and growing segment of the world’s population regards Israel as running the largest concentration camp in the world at Gaza. It bulldozed peace activist Rachel Corrie to death, and its IDF forces are known for picking off Palestinian children for sport. You abuse the word, but it properly applies to such actions by the Israeli government. They ARE filth! As for Sandy Hook, Mike Harris and Gordon Duff have also suggested that Israel may have played a role, where Duff has cited satellite footage that traces a van from the school back to Greenwich Village and a “safe house” run by the Mossad, which was found to contain neo-Nazi literature. Israel is known to commit what are called “false flag” attacks. They go back to the attack on the King David Hotel in 1946 by Irgun terrorists dressed as Arabs and include the Israeli attack on the USS Liberty in 1967. For more, see “False Flag attacks in Argentina: 1992 and 1994″. As you are no doubt aware, the ADL has attacked me, Gordon Duff, Alan Sabrosky and Kevin Barrett as anti-Semitic for pointing out Israel’s role in 9/11, but that is a charge that, as in this instance, has no foundation. I find it ironic that, in classifying me as an “anti-Semitic 9/11 conspiracy theorist”, the ADL cites my article, “Is 9/11 research ‘anti-Semitic’?”, in which I refute that allegation. If you can find cases in which I display anti-Semitism rather than anti-Zionism, then please point them out. Indeed, reading your messages, they could have been penned by the ADL. They display no concern for the issues of freedom of speech and freedom of inquiry that are at stake here. 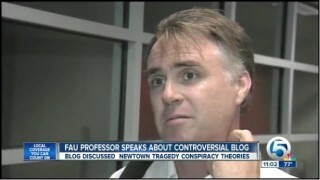 I am grateful to Professor Tracy for speaking out about Sandy Hook, but I am less sanguine about your attacks on me. Have you, for example, taken any steps to affirm his rights in this case as opposed to attacking someone who has actually done that? I have found scant value in your comments to date. Jim Fetzer, a former Marine Corps officer, is McKnight Professor Emeritus at the University of Minnesota Duluth and a journalist for Veterans Today.